(Phys.org)—NASA's Curiosity rover is in a position on Mars where scientists and engineers can begin preparing the rover to take its first scoop of soil for analysis. Curiosity is the centerpiece of the two-year Mars Science Laboratory mission. 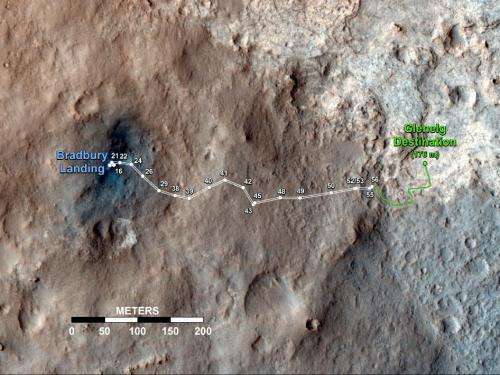 The rover's ability to put soil samples into analytical instruments is central to assessing whether its present location on Mars, called Gale Crater, ever offered environmental conditions favorable for microbial life. Mineral analysis can reveal past environmental conditions. Chemical analysis can check for ingredients necessary for life. "We now have reached an important phase that will get the first solid samples into the analytical instruments in about two weeks," said Mission Manager Michael Watkins of NASA's Jet Propulsion Laboratory in Pasadena, Calif. "Curiosity has been so well-behaved that we have made great progress during the first two months of the mission." The rover's preparatory operations will involve testing its robotic scooping capabilities to collect and process soil samples. Later, it also will use a hammering drill to collect powdered samples from rocks. To begin preparations for a first scoop, the rover used one of its wheels Wednesday to scuff the soil to expose fresh material. Next, the rover twice will scoop up some soil, shake it thoroughly inside the sample-processing chambers to scrub the internal surfaces, then discard the sample. Curiosity will scoop and shake a third measure of soil and place it in an observation tray for inspection by cameras mounted on the rover's mast. A portion of the third sample will be delivered to the mineral-identifying chemistry and mineralogy (CheMin) instrument inside the rover. From a fourth scoopful, samples will be delivered to both CheMin and to the sample analysis at Mars (SAM) instrument, which identifies chemical ingredients. "We're going to take a close look at the particle size distribution in the soil here to be sure it's what we want," said Daniel Limonadi of JPL, lead systems engineer for Curiosity's surface sampling and science system. "We are being very careful with this first time using the scoop on Mars." The rinse-and-discard cycles serve a quality-assurance purpose similar to a common practice in geochemical laboratory analysis on Earth. "It is standard to run a split of your sample through first and dump it out, to clean out any residue from a previous sample," said JPL's Joel Hurowitz, a sampling system scientist on the Curiosity team. "We want to be sure the first sample we analyze is unambiguously Martian, so we take these steps to remove any residual material from Earth that might be on the walls of our sample handling system." Rocknest is the name of the area of soil Curiosity will test and analyze. The rover pulled up to the windblown, sandy and dusty location Oct. 2. The Rocknest patch is about 8 feet by 16 feet (2.5 meters by 5 meters). The area provides plenty of area for scooping several times. Diverse rocks nearby provide targets for investigation with the instruments on Curiosity's mast during the weeks the rover is stationed at Rocknest for this first scooping campaign. Curiosity's motorized, clamshell-shaped scoop is 1.8 inches (4.5 centimeters) wide, 2.8 inches (7 centimeters) long, and can sample to a depth of about 1.4 inches (3.5 centimeters). It is part of the collection and handling Martian rock analysis (CHIMRA) device on a turret of tools at the end of the rover's arm. CHIMRA also includes a series of chambers and labyrinths for sorting, sieving and portioning samples collected by the scoop or by the arm's percussive drill. Following the work at Rocknest, the rover team plans to drive Curiosity about 100 yards (about 100 meters) eastward into the Glenelg area and select a rock as the first target for use of its drill.